It is stable enough for you to (once it is trimmed in) to let your hands off of the sticks and it will stay put in the air for a short time. This makes it perfect for you if you are learning orientation and forward flight. You can pick up this bird for about $95 for BNF and $130 for RTF . Every package of Blade 120 SR contains one RC helicopter, one cell 3.7 volts 500 mAh LiPo flight battery, and a variable rate DC LiPo charger Celectra 1S 3.7 volts. This also comes with a AC to 6 Volts DC 1.5 amps wall power supply, a charger to battery connection wire, a couple of spare parts, screwdriver, and an instruction manual. The rotor span of Blade 120 SR is approximately 12.5 inches and weighs around 3.75 oz. only. It has an overall length of 12.5 inches and a height of five inches. 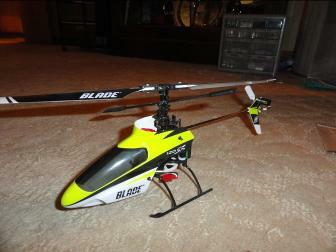 The Blade 120 SR is a fixed pitch type RC helicopter using a JR 11X DSM 2.4GHz 11CH transmitter. This also features a five in one 2.4 GHz on board control (gyro, receiver, mixer, main motor ECS, and fully proportional servos) with 180 brushed motor type. The Bind N Fly Blade 120 SR requires pilots to have their own transmitter that is DSM2 compatible to bind the 120 SR RC helicopter. There are different DSM2 transmitters that can be utilized to fly Blade 120 SR and this includes, Spektrum DX5e, Blade MLP4DSM, and Blade LP5DSM. Spektrum DX6i to Spektrum DX8 are also compatible as well as JR X9303, JR X9503, JR 11X and JR 12X among others. On the other hand, any transmitters that are fitted with Spektrum DSM2 transmission module can be utilized to fly the Blade 120 SR BNF. Compared to RTF (ready to fly) Blade models, the Blade 120 SR BNF is designed for serious hobbyists. Flying the 120 SR can be quite tricky and for beginners who want to use this model, it may require flying outdoors or in a bigger room in order to master the flying technique. The Blade 120 SR is more aggressive and it will certainly push your control limits as you try to improve your flying skills. This micro sized RC helicopter has a fixed pitch and it can be comfortably flown indoors or outdoors during calm conditions. Size wise, the Blade 120 SR is somewhere in the middle between a bigger and heavier SR and a smaller Blade mSR. Flying the Blade 120 SR BNF is very easy especially if you have experience flying Blade mSR and other Blade SR models. However, it will depend on the user what type of transmitter to use to bind their Blade 120 although there are lots of compatible transmitters that can be used to fly this RC helicopter. The instruction manual contains a full instruction on how to bind this copter and it will not be difficult to master the controls once you get a hang of it.